The rules for SEO (Search Engine Optimization) and online content has changed dramatically during 2011. The reason? …Google’s series of updates dubbed “Panda”. In fact 12% of websites were negatively effected as a result, and this even included heavy-hitters such as Ezinearticles.com. Unique content is more important than ever since these Google Panda updates. However, there are many other factors you need to consider in order to keep your website rankings safe. The good news is we’ve obtained PLR’s rights to a fantastic little report which explains exactly how to work with these changes to stay afloat. Having PLR rights to the report means we can give it to you as a free extra bonus with DupeFree Pro! Just login to the members area to download your free copy. Essential information that will help you rank well in the search engines. Clues as to what to focus on and what is a waste of time. How to “repair” your sites if your rankings and earnings have suffered. Exactly how the Panda updates have changed the game. Create an action plan that will give you the success you want. Search engine optimization strategies that will work – right now. 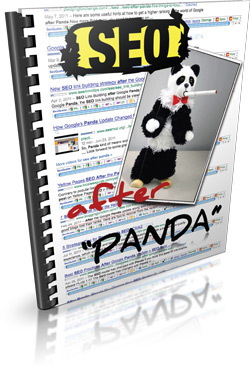 Jump on over to the members area and download your free copy of SEO After Panda.